It’s only been a few weeks since The Walking Dead’s controversial season finale hit the small screen. In a riveting episode, we were finally introduced to one of the comic book’s most dastardly villains: Jeffrey Dean Morgan’s Negan. While AMC’s apocalyptic drama hasn’t always closely followed the comic book source material, the latter half of Season 6, especially the finale, seemed almost identical. Now it appears that The Walking Dead is planning on introducing another comic book character into the fold. 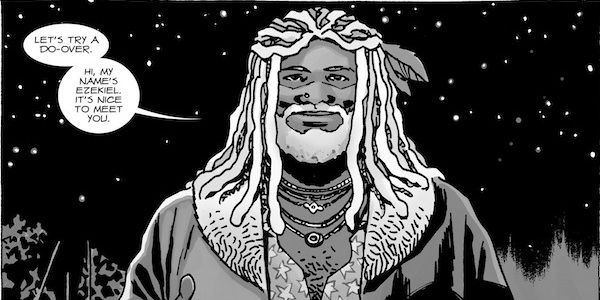 TV Line is reporting that a casting call has gone out for The Walking Dead’s seventh season that seems to resemble comic book character Ezekiel. The audition notice named the character “Augustus” who is described as an African-American male in his 40’s who is "flamboyant and wise, nice and weird”. Sounds pretty much exactly like Ezekiel. These casting calls usually use a code name in order to avoid spoilers for the upcoming season. Ezekiel is a somewhat bizarre but simultaneously beloved character from Robert Kirkman’s Walking Dead comic series. The leader of another community called The Kingdom, Ezekiel is essentially the opposite of Negan. Rather than ruling through fear, King Ezekiel is beloved by his people and is a friend to the Hilltop community that we were introduced to this season. A particular type of badass, Ezekiel was a zookeeper before the zombie apocalypse. As such, he has a pet tiger named Shiva, which serves to increase both his majesty and toughness. Ezekiel is also known to have a relationship with one of the main members of Rick’s group, and helps the group battle against Negan and The Saviors. The introduction of Ezekiel and the Kingdom was teased in the controversial season finale episode “Last Day on Earth” in the subplot between Carol, Morgan, and the lone Savior who was hunting the cookie lady down. After Morgan disavows his no-killing policy to save Carol, he encounters two survivors in body armor who bare hand to hand weapons. He apologizes for accidentally stealing their horse, and pleads for the duo to help Carol with her multiple gunshot wounds. Clearly, there is another community besides Alexandria and The Saviors. The impending introduction of Ezekiel and The Kingdom might be exactly what Rick and company need in order to survive the deadly Saviors. While Rick believed their motley crew would be able to successfully take the Saviors out, it turns out the antagonists have vastly more resources and manpower than originally anticipated. The finale episode saw hundred of Saviors surrounding the group, with the promise of a fatality occurring at the hands of Negan’s batt Lucille. We’ll continue to update you on all things Walking Dead as more details become public. In the meantime, you can watch the spinoff series Fear The Walking Dead Sundays on AMC.